You’ve obviously tried garlic before, but what about this particular variety? Along with fresh peas, baby greens and new potatoes, garlic scapes are among the first tastes of Alberta’s short, but bountiful growing season. Scape stems can reach over three feet in height but only the top seven or eight inches is eaten. The flower bulb at the end twirls around in a graceful curlicue that must be picked before it straightens out and becomes hard and inedible. 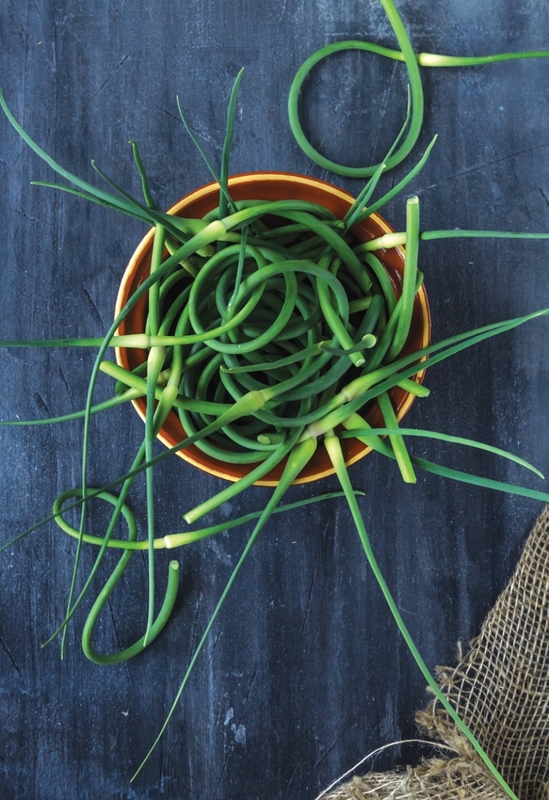 Scapes are picked in a very short window in early July – grab them as soon as you see them. Look for them at farmers’ markets or specialty grocers in town: Chalmers sells her fresh scapes through the Italian Centre Shop. They store well in the refrigerator and also freeze well. Scapes can be used a number of different ways. Often they are treated very simply, either grilled or sauted, in order to highlight their mild, sweet, lightly garlicky flavour. They can also be pickled or served fresh, chopped and sprinkled like chives or green onions. Recipe courtesy of Jackie Chalmers, New Oxley Garlic, Naturally! Combine all ingredients and mix well. Serve on crackers or as a vegetable or chip dip.